The home, which has been nicknamed, the Hard Luck Castle has four-bedrooms and three bathrooms. The fortress is most unusual with a design that is more akin to a science-fiction film set than a secluded hideaway. 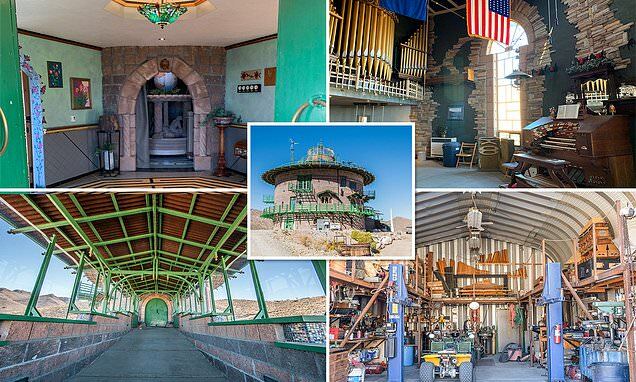 Its walls along are 16 inches thick and are built around the home in a perfect circle with a spiral staircase allowing residents to access all four floors. 'It's absolutely amazing,' says listing agent Jake Rasmuson of Bishop Real Estate. 'You have to picture the middle of Nevada...your views are completely uninterrupted. The main house is made up from 22 rooms that include a theater, wine cellar and games room. There is even a pipe organ build in the 1920s that blasts notes throughout the home when played according to SFGate. The former owner was a builder from Southern California who decided to settle down in the tiny town of Gold Point in Esmeralda County. Just six people live in was is essentially a ghost town. Naturally the home comes with privacy and very few laws for the private land.